One of my best friend's son converted his 2013? Yamaha 450 to street and got it registered here in CT (which is one of the toughest there is for any gray area registrations). He loves it! As a matter of fact, he was having so much fun, my buddy bought a new leftover Husky 501 to ride with him. They are labeled off-road, but have headlights and can be licensed for on-road use out here (so can ATVs and UTVs). I suppose they are a little stricter in some parts of the world. I got to check one out. It felt light compared to my 690. I wouldn't last long on the seat. I couldn't ride it but did start it up. Amazingly quiet, not a whole lot of vibes compared to the 690. Twisted the throttle just a bit and that thing revved up so fast and still felt smooth and quiet. I bet they'll sell a bunch of them. If they make a Rally version I'd really be interested. Depends on who wants to know.........and why. A 1970 Yamaha DT-1 Enduro was $525.00 back in the day. Speed kills..........but only the dumb and the inexperienced! Are they nutz, I won't even go look at it. PLUS tax, title, license, destination and prep charges. If the dealers aren't willing to come off that MSRP price, you're getting up close to the $12k mark for that "dirt bike." Honda did a good job on this machine however, with Mama Kaw making a the 636 for less I hope maybe a KLR replacement is in the works at a reasonable price? 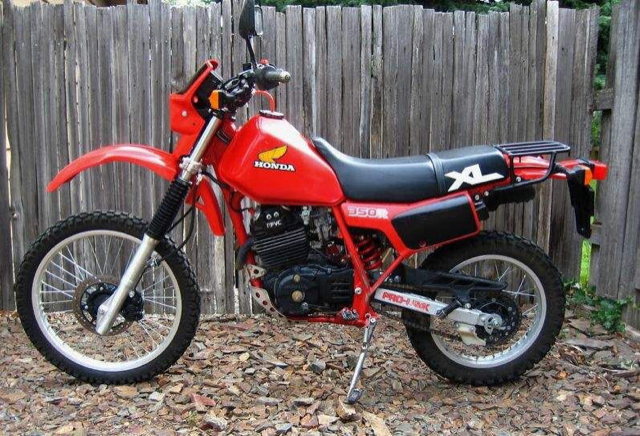 Back in October of 1986, I bought a brand-new Honda XR600R for $1895.00 out the door. Bought it from Sunny Slope Honda. They ran an ad in the paper, I saw it, called and gave um a $50.00 deposit over the phone. Went to pick it up a day or two later. That was one of the best buys on a new bike I ever got. The other great buy I got was back in April of 1987. I bought a brand-new 1986 Honda VF1000R for $4500.00 out the door. About two weeks later, Honda ran an ad on tv. $1000.00 rebate on the bike I just bought. I called the dealer in Phoenix and they immediately gave me the run around, on how I already bought the bike, and I had signed away any rights to a rebate. I told them they were full of chit, and I can't sign away any right that I wasn't made aware of. After a brief conversation about small claims court, I told them they could keep $100.00 of the rebate. That was enough to convince them I was serious. I received a check for $900.00 within 5 days. but basically prep it myself, was $6,800 OTD, I took care of my own tag, registration, taxes at DMV aprox $350 in NC. It don't sound that much at MSRP of $7,199., but usually they tag fees on top of MSRP. But according to dealer, these bikes were really slow sellers, he wanted to move it. I went to look at a new scooter for the wife $1999 MSRP, they slipped me a folded paper with the one time, today only, special of $2799 OTD and a free oil change !! Cam degree 105 int.,107 exh. "TO BOLDLY GO WHERE NO MAN HAS GONE BEFORE" IS EASY, RETURNING IS THE REAL CHALLENGE. How much was an "enduro" in the mid 70s? $10k now was $2,186.66 in '75. 1978 GS750 E . Out the door $2078. The only bike I ever bought new, a 72 Yamaha DT1, a 250 2 stroke reed valve thing, trials tires, street legal, $742. 450's aren't ideal off road here in the tight mostly single track Northeast so I just picked up a modified Yamaha WR250R with just over a thousand miles aon the clock. Bolt-ons, did one enduro aand realized his body couldn't take the abuse anymore. i felt bad for him especially since I'm not.much younger and He wanted.a.Harley! I paid 5 grand for it which is only about a thousand less than leftovers can be had for now but with otd add on pricing, taxes ,and the 1.5k in accessories this bike had it has made me glad I didn't go with the new one of any make or size.